When it comes to road trips, the car I own isn’t necessarily the comfiest but it gets the job done. 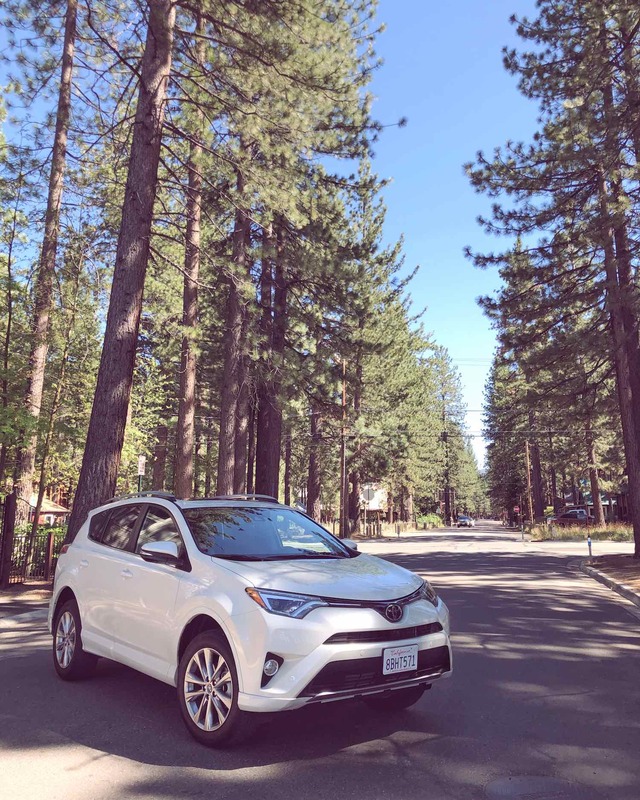 I recently got the chance to test drive the 2018 Toyota RAV4 Platinum, and let me tell you it’s a car that got me excited to go places. 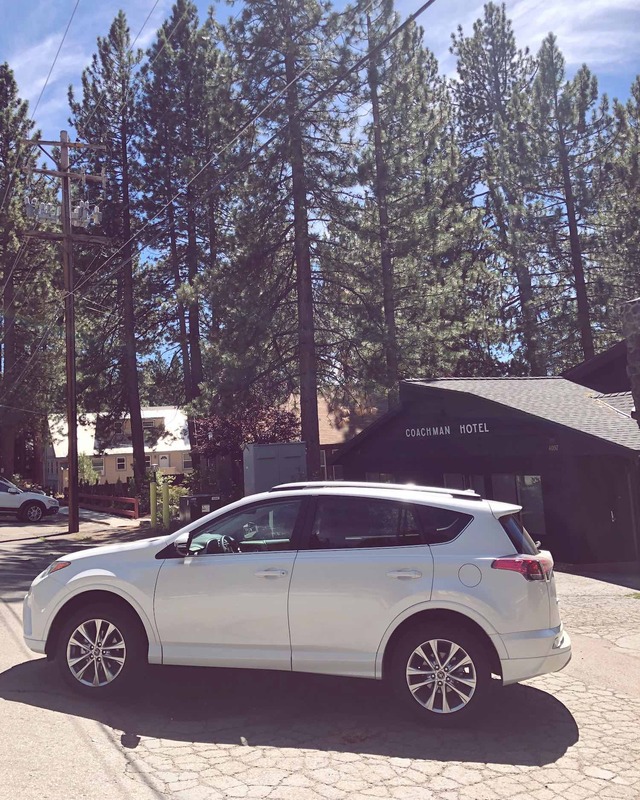 A few weeks ago I took it up to South Lake Tahoe for a few days with my friend Erin on an epic girls road trip. Let me tell you why this car is such a treat. I grew up in a family of Toyotas, so I already know they’re impeccably reliable cars. 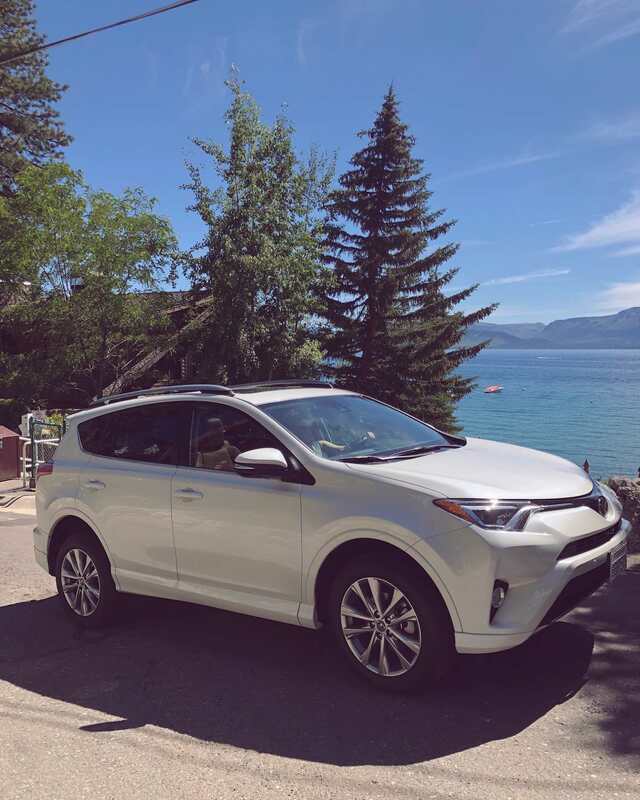 The RAV4 is a crossover SUV that is the perfect size; slightly larger than a sedan but just as familiar to drive. There are RAV4 trim packages for every lifestyle out there, including AWD or hybrids to suit your specific needs. I test drove the Platinum model with front wheel drive and a 2.5L 4-cylinder engine. The paint shade was even Blizzard Pearl, obviously chosen to match my name. This car came fully loaded with all the right luxury features. Heated seats? Check. Heated steering wheel? Of course. Backup camera? Yep. Automatically shutting rear hatch? You bet. Dynamic radar cruise control? Absolutely. The leather-wrapped interior was extremely comfortable while still being entirely functional. Cup holders and USB charging ports were all in logical places in this car. The exterior is sporty without being excessive for city life. In terms of space, five adults could fit comfortably in the RAV4 with plenty of room for luggage. 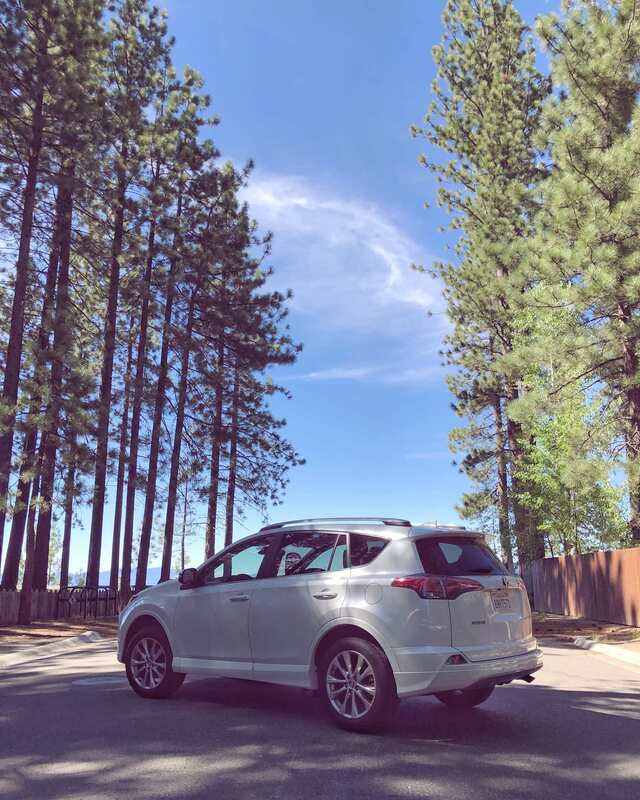 The RAV4 might be the ultimate road trip car. Thinking ahead to winter in Tahoe, this would be the perfect car for a snowboarding trip. The rear seats also fold flat to accommodate things like snowboards, skis, or other sporting gear. Are you a Toyota loyalist like I am? What is your favorite car they make? Finally, if there’s a make or model of car you’d like me to review I’m always open to suggestions. Thanks for reading, and happy travels! Thank you Toyota for loaning me this RAV4 for this trip. Great photos. My sis had a RAV4. I like the look of this one far more. The interior looks great too. oh my gosh how fun my friend! ive heard such great things about this car from a friend and especially on road trips it seems like such a dream! heated seats are the best! Dang girl! Who knew a Toyota could look like that on the inside. This is nice. definitely checking this out for my next car. Look at that leather detailing! OMG. I wish I needed a new car right now. If I did, I’d be heading to the dealer immediately asking for a RAV 4! My first car was a toyota! I am a die hard! 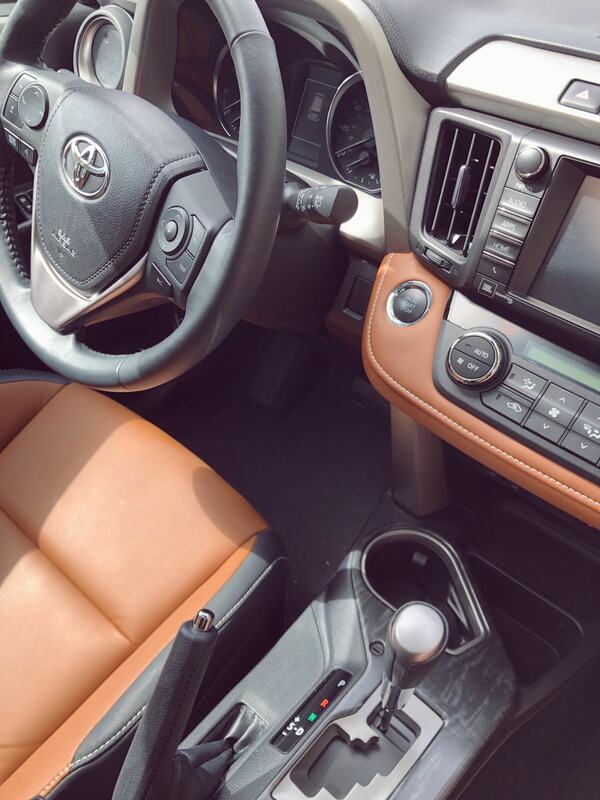 Love the interior of this Rav 4!! I have an older model of the RAV 4 and love it! I can’t wait to upgrade to the Platinum someday! It looks so snazzy on the inside! I love toyata’s, such a reliable car! What an awesome post and trip!